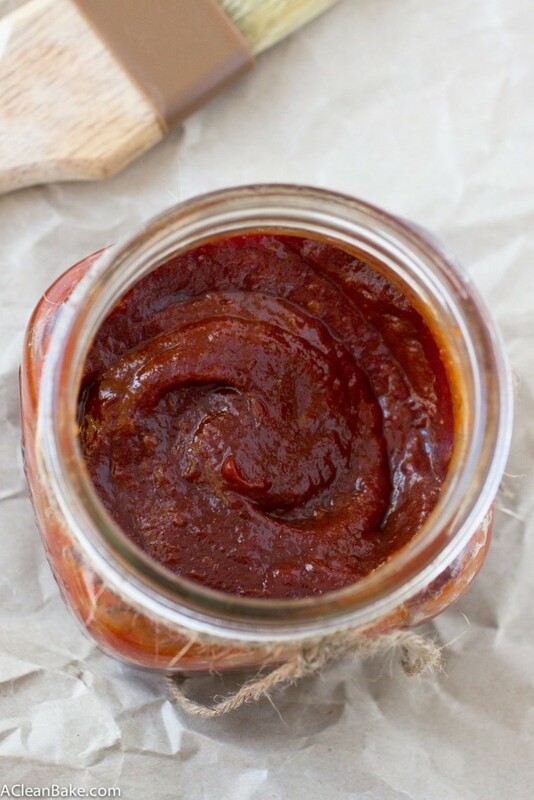 This low maintenance crockpot BBQ sauce doesn’t require any stovetop cooking, and is free of refined sugar. It’s also vegan, paleo, gluten free and totally hands off, thanks to your slow cooker! The ultimate set-it-and-forget-it condiment! By now, I am pretty sure you all know of my borderline-masochistic love of making my own nut butters, dips, and condiments from scratch, rather than plucking a ready made bottle off of the shelf at the grocery store and being done with it. As far as the condiments category goes, BBQ sauce seemed like a perfect candidate to celebrate and take full advantage of each of these last warm, sunny bonus days of summer. At least it did, when I started working on this recipe a couple of weeks ago. Now, it’s cool and grey and windy. Yesterday it rained. To most normal people, barbecue season is a fading memory, and it would have probably made much more sense for me to post this recipe earlier in the summer, but how predictable is that??? I like to keep you on your toes. Plus, this recipe is not so much a summer grilling celebration as a love letter to my slow cooker (née crockpot), whose willingness to provide delicious food for my household without so much as a stir – let alone a stove and the attention that kind of a recipe demands – from me. I’ve never been more in love with a household appliance*. It can literally make nearly anything. I’ve done meat, vegetables, soup, and now sauce. I want to try to roast a chicken and vegetables in it, because why not, and then I have some crockpot dessert ideas. Does anyone else mind if this period of ovenless-ness turns into an over-the-top crockpotstravaganza? Just kidding, I wouldn’t do that to you, but I am kind of having a moment with my crockpot right now. And a sauce moment! Oh my gosh, this sauce. If ever there were a recipe to gush over … well, look, I can’t pick favorites. My recipes are like my children: I love them all equally. No, that’s a bold-faced lie. I love this sauce like a parent loves their favorite child. Except my dad, who loves the dog most (I’m not offended. I can’t compete with two pointy ears and an enthusiastic tail. I mean, I’m not one to talk…). Here’s the thing about it: It’s easy, and it tastes fantastic. You literally throw everything in the crockpot, give is a quick stir and leave it to percolate into thick, saucy goodness. I set out to make this recipe for one major reason, and that was sugar. Store-bought barbecue sauces either cost and arm and a leg for the small batch super-premium kind or are affordable and accessible but contain mostly sugar and high fructose corn syrup. 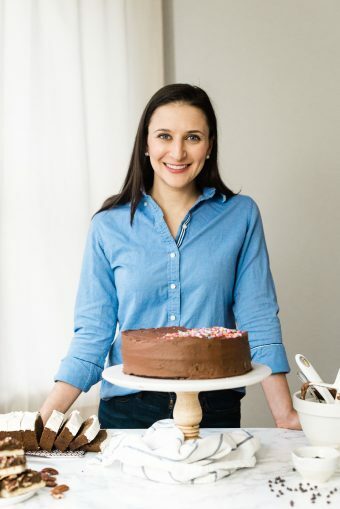 I wanted to make a recipe that was not only naturally sweetened with the natural sugars of the tomatoes plus a touch of unrefined sweetener (molasses works best, but you can also use maple syrup if you prefer) and that’s exactly what distinguishes this recipe. There is one unconventional (at least in my kitchen) ingredient in this sauce, which you can absolutely feel free to skip, and that’s the liquid smoke. Liquid smoke is available at major grocery stores near the barbecue sauces and it is exactly what it sounds like: a liquid flavoring agent that lends the deep, smoky flavor to the sauce that you probably expect. However, it does contain a touch of sugar, and “hickory smoke flavor” – which I assume is likely artificial – so I would certainly understand if you weren’t comfortable adding that to your otherwise-clean sauce. Personally, I felt that the tiny bit that the recipe calls for was worth the flavor bump it provides. Plus, my husband wouldn’t eat it the sauce without the smokiness! He was right though; it was delicious. If you opt to leave out the liquid smoke, I highly recommend increasing (probably doubling) the spices, and making sure to use the smokiness paprika and chili powder you can find. Whether or not you go for liquid smoke or extra spices, make sure you have a batch on this on hand for next week, so you can make a delicious (easy!!) dinner recipe that I have in store for you. *I reserve the right to re-evaluate this statement when my new stove arrives. Updated to add: A few readers have asked what size and model slow cooker that I used for this, because it has some bearing on cooking time. This 4-quart model is the one I use. In the bowl of a 4 quart crockpot (this is the one I use), stir together the tomato puree, vinegar, molasses, tamari and mustard until combined. Cook, uncovered, on high for 3 1/2 - 4 hours until thickened and darkened in color. Store in an airtight container in the fridge for up to a month, or in the freezer for up to 6 months. If you don't have or want to use molasses, you can use maple syrup instead. There is one unconventional (at least in my kitchen) ingredient in this sauce, which you can absolutely feel free to skip, and that's the liquid smoke. Liquid smoke is available at major grocery stores near the barbecue sauces and it is exactly what it sounds like: a liquid flavoring agent that lends the deep, smoky flavor to the sauce. However, it does contain a touch of sugar, and "hickory smoke flavor" - which I assume is likely artificial - so I would certainly understand if you weren't comfortable adding that to your otherwise-clean sauce. Personally, I felt that the tiny bit that the recipe calls for was worth the flavor bump it provides. If you opt to leave out the liquid smoke, I highly recommend increasing (probably doubling) the spices, and making sure to use the smokiness paprika and chili powder you can find. If you're not using liquid smoke, use the smokiest chili powder and paprika you can find. I’ve been wanting to try using liquid smoke!! I don’t have a BBQ in our apartment (sigh) so I’m always looking for that smokey taste. It turns out it is a great product! I admit I was a little skeeved out by the idea at first but it’s such a small amount of sugar and flavor for such a vast benefit that I decided to make an exception. It’s SO worth having a bottle on hand, for the bbq sauce benefits alone! Liquid smoke is a staple in my home. I add it to my hamburger meat before I prep the burgers. Yummy!! Thanks for the ideas! I don’t use it often, but should start branching out! 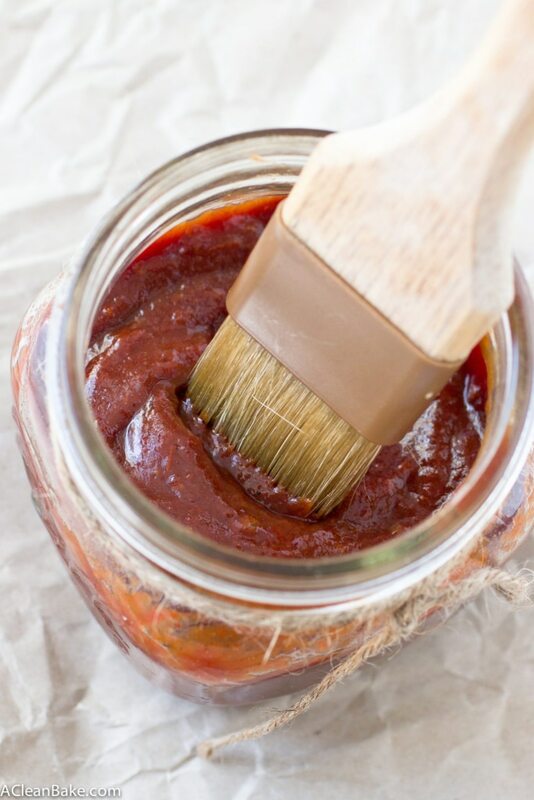 I’ve always wanted to make my own bbq sauce! This recipe perfect to do so! Awesome! I hope you like it, Bethany! I’m so with you on the absurd prices on bottled barbecue sauce. It’s just insane! This looks so much better. I always have a bottle of liquid smoke in my fridge and I loved that you used it here! I’ll have to try it! Oh I’m impressed that you always have liquid smoke on hand! What else do you use it for? I use it in my hamburgers and in my stew. I also use it when I make a homemade sauce for my ribs or steaks in my crock pot. wanna know why i don’t make my own dips? Because i have no control with them. or nut butters! haha. YES! too good! Is it possible to process this and seal it? Or just freeze it. I haven’t tried processing it (but since it contains so much tomato, you will probably have to pressure-can it) so I can’t say for sure. But I have had lots of success with freezing, if you have the room in your freezer! Oh man, I’ll bet! Thank goodness you have a tool that helps you spend as much time as you can with your son and stuff eat home cooked meals! 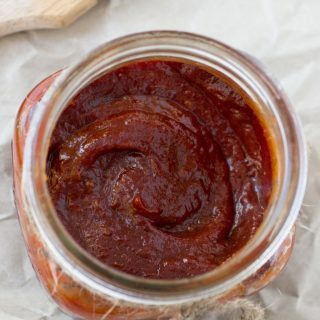 I’ve been looking for a homemade clean version for BBQ sauce. I love the looks of this one! Thanks for sharing. Hi! Thank you so much for this recipe! It looks great! How long does it stay good in the refrigerator? And if I make a large batch, should I freeze it? Sorry! I just saw it at the end! Never mind! If I’m making this for pulled pork can I just add all the ingredients in with 4 hours left on the pork? If so will it be a problem to have the lid on? Hi Lauren! Actually, I’d recommend the opposite. For pulled pork, I make the BBQ sauce first and then add the pork after it (the sauce) is finished. Just cover and cook as you would with bottled sauce.